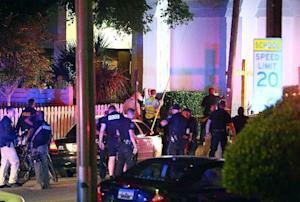 CHARLESTON, S.C. (AP) — An intense manhunt was under way Thursday for a young white man who joined a prayer meeting and then opened fire inside a historic black church in downtown Charleston, killing nine people, including the pastor, in what authorities called a hate crime. This is a very dangerous individual," Police Chief Greg Mullen said. "We want to identify this individual and arrest him before he hurts anyone else. "The shooter remained at large Thursday morning and police released photographs from surveillance video of a suspect and a dark colored sedan that may have been the getaway vehicle. The suspect stayed for nearly an hour at the prayer meeting Wednesday night before shooting the victims — six females and three males, Mullen said. Mullen did not give other details and said names would be released after families were notified. But State House Minority leader Todd Rutherford told The Associated Press that the Emanuel AME Church's pastor, state Sen. Clementa Pinckney, was among those killed. Pinckney, 41, was a married father of two who was elected to the state House at age 23, making him the youngest member of the House at the time. "He never had anything bad to say about anybody, even when I thought he should," Rutherford, D-Columbia, said. "He was always out doing work either for his parishioners or his constituents. He touched everybody." 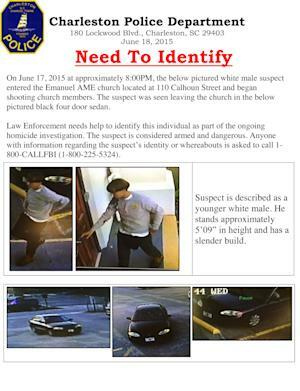 The suspect was described as a white man in his early 20s. Mullen said he believed the attack was a hate crime and a Justice Department spokesman said federal officials were opening a hate crime investigation. The spokesman spoke on condition of anonymity. The official was not authorized to be quoted by name because the federal investigation had not been announced. Mullen said he had no reason to think the suspect has left the Charleston area, but was distributing information about him and the vehicle around the country. Mullen said the scene at the church was chaotic when police arrived, and officers thought they had the suspect tracked with a police dog, but he got away. "We will put all effort, we will put all resources and we will put all of our energy into finding this individual who committed this crime tonight," he said. In a statement, NAACP President and CEO Cornell William Brooks condemned the shooting. "There is no greater coward than a criminal who enters a house of God and slaughters innocent people engaged in the study of scripture," Brooks said. Soon after Wednesday night's shooting, a group of pastors huddled together praying in a circle across the street. Community organizer Christopher Cason said he felt certain the shootings were racially motivated. "I am very tired of people telling me that I don't have the right to be angry," Cason said. "I am very angry right now." Even before Scott's shooting in April, Cason said he had been part of a group meeting with police and local leaders to try to shore up relations. The Emmanuel AME church is a historic African-American church that traces its roots to 1816, when several churches split from Charleston's Methodist Episcopal church. One of its founders, Denmark Vesey, tried to organize a slave revolt in 1822. He was caught, and white landowners had his church burned in revenge. Parishioners worshipped underground until after the Civil War.